Here at Azazie, we love helping you look and feel beautiful during life’s most magical moments. But you don’t need an invitation to an extravagant ball to have a reason to wear a dress that wows. You can transform any day into a spellbinding occasion with a little bit of homemade creativity. Our “Enchanted Evening” looks are all about finding the magical in the everyday. Put on that party dress and get ready to dance the night away with your crew. 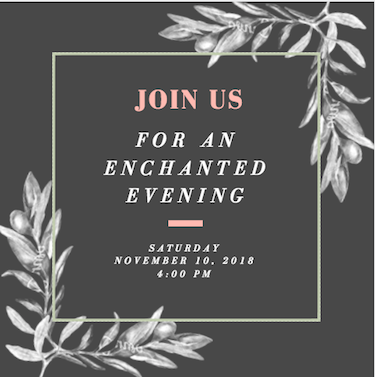 We’ve put together a few tips to help you make the most of your own Enchanted Evening party. 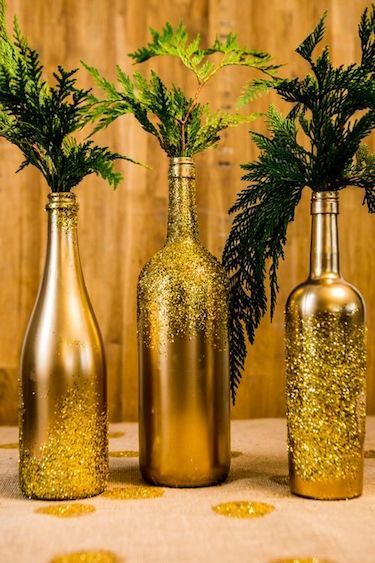 Add a little bit of real-life fairy dust into your decor by including touches of sparkle, like these DIY gold glitter centerpieces, or tie these glitter-dipped feathers to balloons for extra flair. Turn your backyard into a whimsical oasis by stringing fairy lights between trees, or DIY lighted copper wreaths for unique decor. Incorporate sparklers for Insta-worthy photos. Don’t forget a cozy firepit and blankets for colder climates! 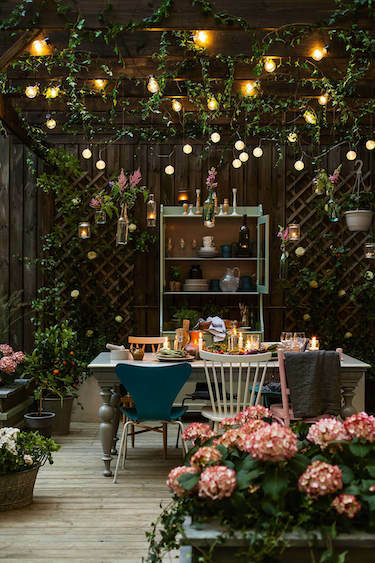 If you’re hosting indoors, create your own midnight garden by incorporating lots of greenery and florals into your theme. 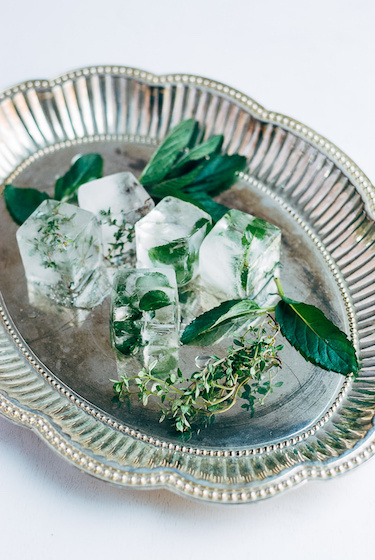 Incorporate a DIY greenery table runner or delight your guests with these fruit and herb infused ice cubes. Canva is a great online site to create your own invites absolutely free! 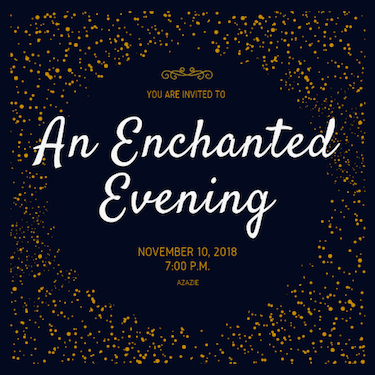 Some of our favorite Enchanted Evening templates include a dreamy blue leaf design, a black and gold art deco pattern and an ethereal floral design. Champagne is always a good idea. 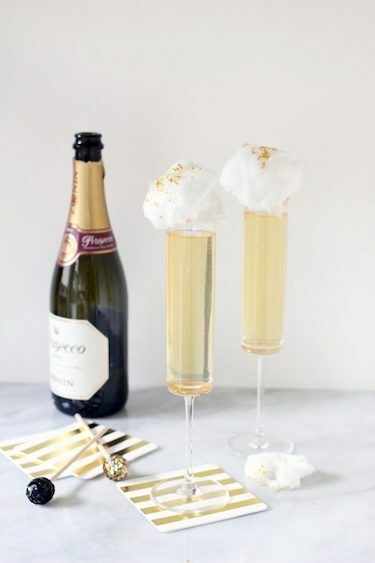 Allow your guests to sip in style with this ginger & prosecco cocktail recipe — adorned with cotton candy! Don’t forget the gown! Peruse our site for your perfect match from our evening dresses collection. With dramatic silhouettes, head-to-toe sequins, mermaid fits and more, you’ll be sure to find the dress of your dreams. We also offer perfectly-matching ties for your leading gentleman. If you already own one of our styles, check out our tips for transforming any Azazie bridesmaid dress into a fall/winter gown… just call us your Fairy Godmothers. Ready to throw your own party? Be sure to include the #enchantedazazie hashtag for a chance to be featured on our Instagram page!